1712 MGS (Meadows to George St) Council briefing sheet following CL+ bid success. Council bid for CL+ funding [pdf 4MB] Spokes presentation on deliverability to judging panel [ppt]. 1706 Causey Project (1609 below) Revised proposals re-instate the cycle lanes! 1503 Marchmont-KB onroad route Consultation responses summary [pdf 197k]. Response to Spokes submission [pdf 73k]. 1411 Marchmont-KB onroad route Consultation page [link]. Consultation leaflet [pdf 605k]. Spokes response [pdf 123k]. 1411 QBiC Useful ideas by EdinburghBikeLanes blog on possible future segregated options. 1409 Canal-Meadows Official report of 1403 workshop [3MB]. Detailed plans for public comment  [pdf 1.3MB]. Spokes submission [pdf 68k]. 1406 Meadows-Innocent Outcome of consultation [pdf 175k]. Most of our points [1312 below] have been accepted in the revised plans. 1403 Canal-Meadows Council workshop to scope preliminary ideas [pdf 299k]. Our notes from the workshop [pdf 137k]. 1312 Meadows-Innocent Council consultation on proposed route. Spokes response [pdf 68k]. 1311 Morningside to Myreside path opportunity Redevelopment of the Royal Edinburgh Hospital offers a great opportunity – but the path plans need improved and greatly speeded up. 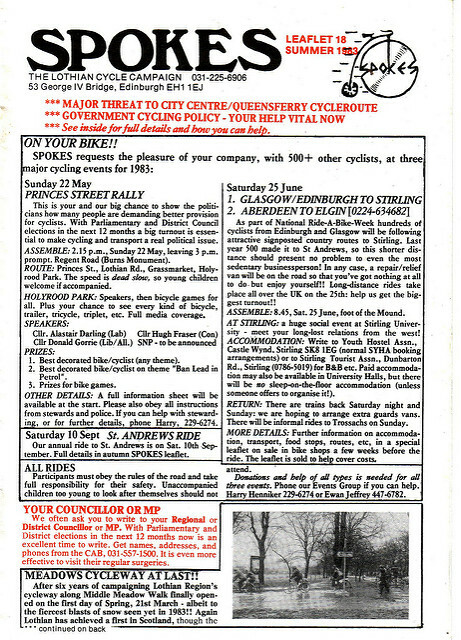 Spokes circular to local members [pdf 106k]. 1308 South-Central 20mph zone – Evaluation Report [pdf 3MB] Very positive report, supporting bolder 20mph future policy. 1212 QBIC Interesting blog by Council Leader Cllr Andrew Burns, and useful discussion in comments on the blog. 1211 North Meadow Walk upgrade The government offered last-minute new cycling money in the draft budget, to be spent this financial year. Spokes urged the council to apply to upgrade North Meadow Walk, as this could be done in the very limited timescale – and the council bid successfully. Draft plans are here… West section [pdf 417k] East section [pdf 343k]. Spokes is consulting local members in the very short time available. 1211 Post-QBiC traffic count [link to news story] First Spokes count after QBiC (nearly) completed. 1208 QBiC post-installation issues [pdf70k] This document reports problems with the implementation of QBiC – it is not commenting on the concept of QBiC. 1104 Revised QBiC proposals – discussion with council [pdf 63k] Spokes requested a meeting to discuss changes made as a result of the consultation – overall very pleased with the changes. Biggest remaining problem is need for red surfacing throughout – letter to Transport Convener Cllr Mackenzie re red surfacing [pdf 60k]. 1012 Final Spokes submission on 20mph consultation [txt 4k] Currently we expect the report on this and the QBC consultation to go to the Council Transport Committee in February 2011, where a final decision is likely to be taken on whether to go ahead, and on any final changes to the proposals. 1011 Preliminary Spokes thoughts on the Quality Bike Corridor [rtf 20k]. This document also includes a note from the Council as to why nothing is shown for cyclists northbound between Potterrow and Teviot triangle. 1011 Preliminary Spokes thoughts on the 20mph proposal [rtf 10k]. 1010 Quality Bike Corridor – official pages [link]. The consultation pages include a QBC consultation leaflet [pdf 550k] and also detailed drawings of the entire route [at the above link – many MB to download]. 1010 20mph-zone – official pages [link]. The consultation pages includes a 20mph-zone consultation leaflet [pdf 522k]. 0910 QBC initial announcement – see pages 1 and 5 of Spokes Bulletin 105 [pdf 2190k]. 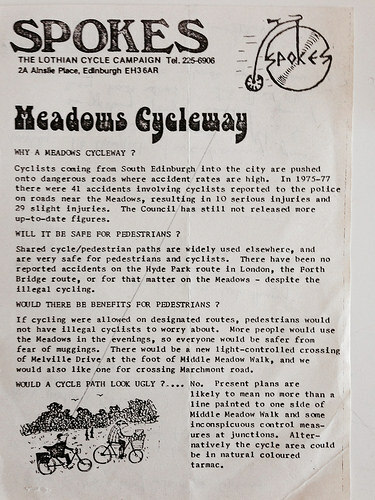 8303 Meadows Cycleway opens Photo [Cllr Gorrie with glasses] Spokes Bulletin 18, page1. 7806 Campaign for Meadows Cycleway – Spokes report to Council [pdf from scan] Campaign flyer [pdf] Spokes exhibition at Meadows [photo: Left.. Meadows campaign organiser David Bellos; Centre.. Cllr Bob Cairns with Dave du Feu behind; Right.. Cllr Donald Gorrie].